Is Alex Rodriguez the Clear 3rd Pick? Alex Rodriguez is coming off a season in which he hit 30 home runs, drove in 100 runs, and hit at least .285 for the 13th straight year. Regardless of the real world value of RBI and BA, there’s something to be said for that kind of consistency. Rodriguez also posted an OPS over .900 for the 12th time in 14 seasons, so pondering whether he’s a top-five pick, when he still plays third base, seems odd. B-Rank (Bloomberg Sports’ proprietary ranking of all players) rates Rodriguez as the third-best player available, behind the obvious choices of Albert Pujols and Hanley Ramirez. A-Rod is followed by Ryan Howard at fourth, Matt Kemp fifth, Ryan Braun sixth and Prince Fielder seventh. Some fantasy players who place a heavy emphasis on position scarcity are also drafting Joe Mauer in this rarefied air. Even A-Rod’s steals (14 last year, an average of nearly 19 a season over the past three seasons) rate as above average. Still, let’s consider the argument against. First, A-Rod turns 34 in July. He played in fewer than 150 games for the second consecutive season in 2009. He saw his isolated slugging (slugging percentage minus batting average) decline, despite playing in a more hitter-friendly environment. An encyclopedia’s worth of print has been produced dissecting how baseball hitters age. The common thought – presented here with all the gory math included – is that hitters on average progress rather linearly, peaking around age 27, then beginning a slow descent in their 30s. 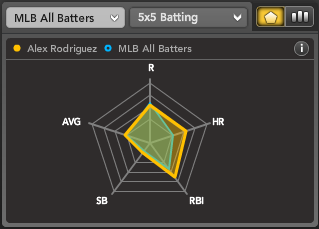 Of course Rodriguez has never been accused of being average. Still, consider this: Rodriguez plays in the toughest division in baseball and he’ll face two of the best starting rotations in baseball, the Red Sox and Rays. That’ll take a toll on a player’s offensive production too. Rodriguez’s Bloomberg Sports projection of 43 homers, 121 RBI, 15 steals, and a .297 average appears to be on the optimistic side. Other projection systems, like CHONE and Marcel, have Rodriguez hitting 34 and 31 homers respectively. Such a spread is not found with, say, Ryan Braun’s projections; the Brewers outfielder is projected by all three forecasters to hit 33-35 homers with a .300+ average in 2010. Braun also figures to steal more bases, though he probably won’t score more runs or drive more in – the Brewers’ offense is good, but probably not Yankees-level good. It’s a tough call choosing between A-Rod and Braun, and that’s leaving aside players like Mauer, Kemp and others in this spot. You might want to hope for the number-one pick, or something a bit later. 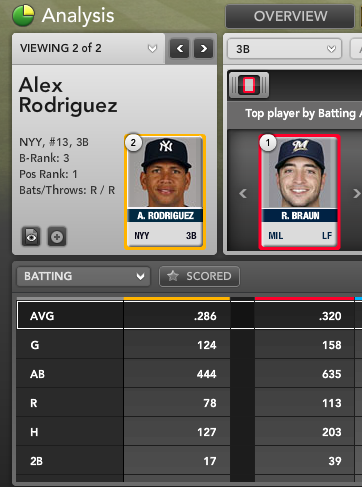 For more information on Alex Rodriguez and hundreds of other players check out Bloomberg Sports’ fantasy tools.